All Wisteria English Cream Golden Retriever puppies receive lots of love, attention, socialization, and are started on basic training. Providing the best care and giving them a good foundational start is very important to us. We have built a solid reputation on providing quality care and healthy puppies. We love receiving letters, pictures, and updates from our Wisteria Golden family members. We have a wonderful community of Golden Retriever families on our Facebook Page — (Wisteria Goldens Facebook Page) as well. 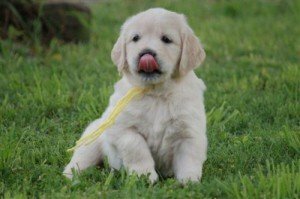 While there are many breeders that raise English Cream Golden Retrievers, we are often asked “what sets you apart from other breeders and why should we buy our puppy from you?” We think this is a difficult question, because there are so many wonderful breeders that raise quality, healthy puppies. We can’t answer questions about other breeders and their breeding program, however, we can provide information about our breeding program and who we are. Here is our routine for giving our English Cream Goldens a great foundational start in order to become the best possible member of your family. 5 – 6 weeks of age: Introduced to “treats” (for baited commands), puppy parties in the yard and training room. Introduced to the command “careful” for learning how to be careful with taking treats. They also meet “Tom Cat” who LOVES the puppies. Living in the country provides wonderful benefits of giving the puppies plenty of room to play, however, exposing them to city noises does present a challenge. We start playing environmental Cd’s at about 4 weeks of age, exposing them to a variety of sounds such as: babies crying, trash trucks, airplanes, gunshots, fireworks, and many more…. We start using “Through A Dog’s Ear” Cd’s while the puppies are nursing, conditioning them to this music while they are engaging in something enjoyable and positive. When introducing them to the crate then play this music to help them associate it with something good which eases them into the crate training process. We invite you to read our blog, visit our website, and our Facebook Community to help you decide if Wisteria Goldens is the right choice for you and your family. We believe that there is the right puppy for each family, and would be honored if we can provide that for you.